The important role of soil moisture for the environment and climate system is well known. Soil moisture influences hydrological and agricultural processes, runoff generation, drought development and many other processes. It also impacts on the climate system through atmospheric feedbacks. Soil moisture is a source of water for evapotranspiration over the continents, and is involved in both the water and the energy cycles. Soil moisture was recognised as an Essential Climate Variable (ECV) in 2010. The Soil Moisture CCI project is part of the ESA  Programme on Global Monitoring of Essential Climate Variables (ECV), better known as the Climate Change Initiative  (CCI), initiated in 2010 for a period of 6 years. The CCI Programme wants to contribute to the data bases collecting ECVs required by GCOS (Global Climate Observing System) and other international parties. Analyse the needs of the climate research community in terms of soil moisture data. 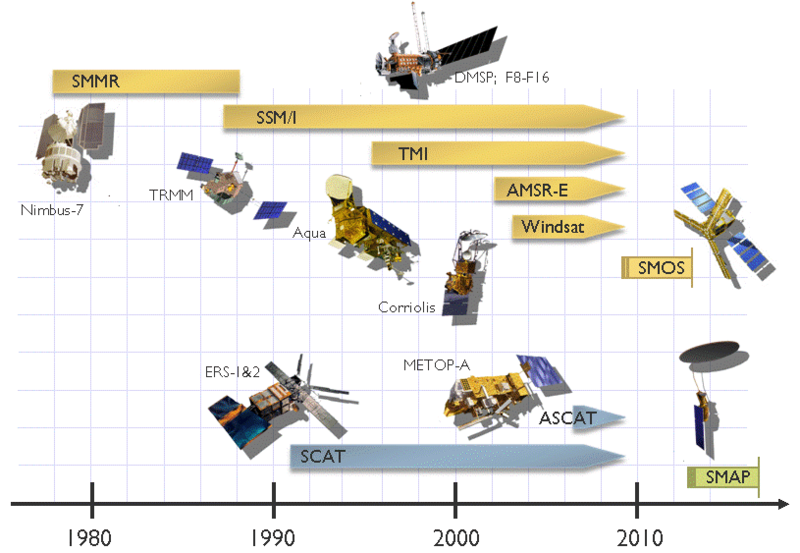 Adapt soil moisture satellite measurements for their use by the climate research community. Create a long-term consistent soil moisture time series, based on active and passive data, suitable for climate change studies. This CCI project will not only “generate complete specifications for an operational production process” as called for by the Global Climate Observing System (GCOS) but, through its ties with long-term programmes of EUMETSAT (Satellite Application Facilities) and NASA (Goddard Earth Sciences Data and Information Services Center) it can provide the necessary leverage for cost-efficient operations of the “add-on” ECV production system. The project focuses on C-band scatterometers (ERS-1/2 scatterometer, METOP Advanced Scatterometer) and multi-frequency radiometers (SMMR, SSM/I, TMI, AMSR-E, Windsat) as these sensors are characterised by their high suitability for soil moisture retrieval and a long technological heritage as can be seen in the figure below. Other microwave sensors suitable for soil moisture retrieval, including the Soil Moisture and Ocean Salinity (SMOS) mission, Synthetic Aperture Radars (SARs) and radar altimeters, are not considered in the first phase of the CCI programme due to their recentness and/or their unfavourable spatio-temporal coverage. Nevertheless, the ECV production system will be set up in such a way as to allow the integration of all these sensors in the next phase(s) of the CCI programme. Active and passive microwave sensors used for the generation of the ECV soil moisture data sets. Although the Soil Moisture and Ocean Salinity (SMOS) and the Soil Moisture Active Passive (SMAP) missions will not yet be considered in Phase 1 of the CCI programme, they are already included in this diagram to highlight their potential inclusions in the ECV production in the next CCI phase. 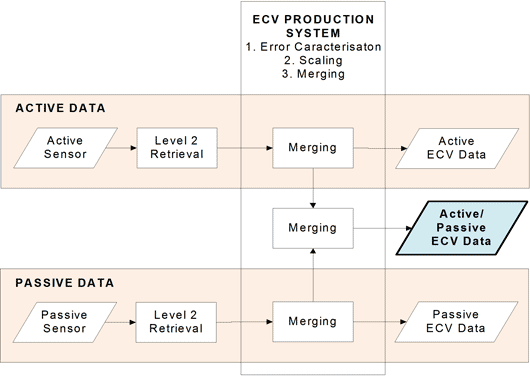 In order to make best use of existing European and international programmes, and to ensure that new sensors such as SMOS can be integrated quite easily, the design of the ECV production system is as modular as possible. As illustrated in the figure below, the main characteristic of the approach is that the merging of the different sensor-specific data sets takes place at the level of the retrieved surface soil moisture data (Level 2). The conversion of the Level 1 backscatter- and brightness temperature measurements to surface soil moisture is hence not considered to take place within the ECV production system itself, but before the ECV production system. In this way it becomes possible to make best use of already established Level 2 services of ESA, EUMETSAT, NASA, JAXA, etc. for the different satellites and sensors. The CCI SM project expects that this approach will encourage international cooperation in multiple ways, e.g. in terms of the ECV production process itself or in terms of defining GCOS standards. Principle approach to ECV soil moisture production as first applied within the WACMOS project. A major element of the CCI programme is to broadly involve the international community to make sure that the project lives up to the highest scientific standards, respectively contributes to defining these standards itself. In particular, the project will contribute to tasks of the Terrestrial Observation Panel for Climate (TOPC), the CEOS Land Product Validation group and the International Soil Moisture Working Group (ISMWG).